Ipad2, Iphone 4S, Blackberry, Samsung Galaxy Tab, Camera & Play Station 3. Spend RM150 and above in a single receipt. 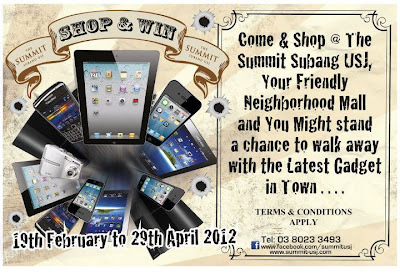 Visit The Summit Subang USJ Facebook fan page for more detail. Looking for a job? Sign up Jobs Central now!